Drawing & Details later today! Royal Blog Tour-Autumn Days WITH Details! I had a request to do this technique, so we did all three cards with it! It isn't near as complicated as the result looks!! You need reinkers, rubbing alcohol, cotton balls, glossy cardstock & Stazon Ink. The official technique is documented HERE on Splitcoaststampers. Note that all my samples are done WITHOUT using metallic inks. I do NOT like having to seal something, especially in a group setting so I left out the metallic! The look is still great!! Other things to note: all my samples use similar color tones. You can use contrasting tones but be careful not to "muddy" the colors with too much blending. Every one of these will come out different! Every stamper has a different touch, and it will vary with how much ink, how much alcohol, and how many times you go over it! The technique in simple form: Get your glossy cardstock. Take a cotton ball and wet with rubbing alcohol (not saturated & dripping). Using the reinkers, put ink on the wet cotton ball in 3-4 places. So, if you use 4 colors as I did, do a dot of each color. A significant dot so that you have ink to blend around. Then, dab the cotton ball onto the cardstock. Your first few dabs will leave dots of color. Keep dabbing, going back over the ares you did previously until you've colored all the glossy and have the color look you like. Let dry (doesn't take long) & stamp as desired with Stazon Ink. I'm going to share two samples now, and the third in a later post! This is the first one I did, using the Upsy Daisy set. I knew it would be great with this technique. You can use bold image stamps with this, or outline stamps (as below). Card base here is More Mustard and is wheeled with the Friendly Words jumbo wheel. The colors used for the background were More Mustard, Summer Sun, So Saffron & Mellow Moss. The Black Gingham ribbon was tied around the front of the card. The 'stone' image is layered on Basic Black and then over the ribbon onto the More Mustard. The Wide Oval punch is Basic Black is layered behind the Scallop Oval punch of More Mustard and the Large Oval used for the saying. The ovals were attached with a Dimensional. This is the second card I did, chosen to show how an outline image stamp works. I was afraid it was a little too dark, but all my ladies loved it! I really like the richness of Elegant Eggplant and this card really showcases that!! 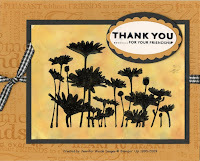 This MAY be one of the cards for YOU to stamp at one of my New Catalog Open Houses! RSVP today!!! The colors used for the "stone" were Elegant Eggplant, Perfect Plum & Pale Plum. I think I had 2 dots of Eggplant & 1 each of the Plums. 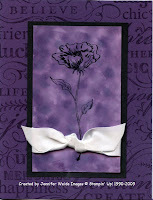 The card base is Elegant Eggplant and is stamped with the Tres Chic background in Eggplant. The image has the 5/8" Whisper White Satin ribbon knotted around it and is layered on Basic Black. That's it! Simple, but elegant! and perfect for any occasion! What pretty cards! I really like the stone effect with out the metallic ink and will be trying this soon. Thanks for sharing! !